June begins in the wake of May's intense astrological events and under the influence of many significant planetary, environmental, and political changes. In late May Mars completed an intense eight month journey through its sign of debilitation pointing to our own disabling addiction to oil energy. It entered the sign of Leo opposite the ruler of oil, Neptune in Aquarius, which promises to keep our attention on this life-threatening disaster through mid-July. On June 3, 2010 the opposition was exact and the next day the headlines revealed the possibility that there may have been prior knowledge that the oil spill was imminent: Goldman Sachs sold 44% of its BP stock three weeks before the spill, and the notoriously opportunistic and greedy Halliburton bought a oil spill clean up company, Boots and Coots, 8 days before the oil spill. Oh and did I mention Halliburton was responsible for the cementing work on the Deepsea Horizon, which was completed 20 hours before the explosion. They are now under investigation. Mars in Leo may give some energy and aggressiveness to our leaders to keep the corporate players in line. 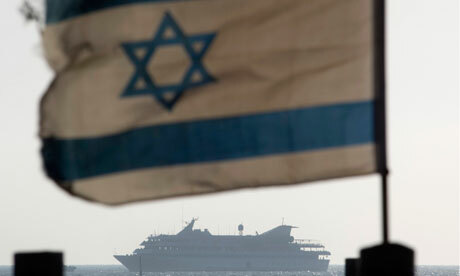 Mars in Leo may also have played a role in the politically charged Gaza incident in which commandos from the Israeli Defense Forces (IDF) boarded the relief ship MV Mavi Marmara in international waters after communicating warnings that a naval blockade of the Gaza area was in force. In the violent clashes that followed, nine activists were killed. And, as reader Paradise points out, Mar-Mar-a contains a double Mars. Mars is associated with the number 9, and the death of 9 activists is another symbolic layer of its increasing strength in Leo. Mars rules war and we may witness an escalation in hostilities around the world this summer as it heats up in the sign of the Sun. The month of May ended under a debilitated, though enlightening full moon in Mar's sign Scorpio. 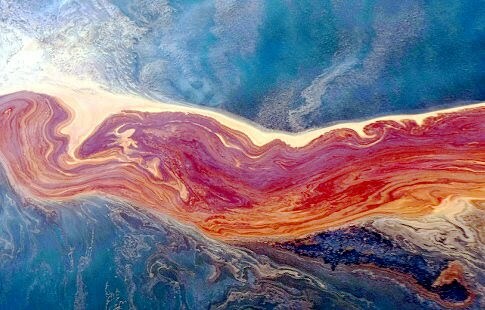 As I indicated in my previous post, this full moon occurred within four degrees of the rising sign in the event chart for the BP Oil Spill. The bright light of this full moon illuminated some of the hidden causes and factors that may have triggered this unprecedented environmental disaster, as well as the responsible parties and failed plans to plug the hole. Notice the Scandi Neptune description on this video still -- Skanda, the son of Shiva, is another name for Mars. 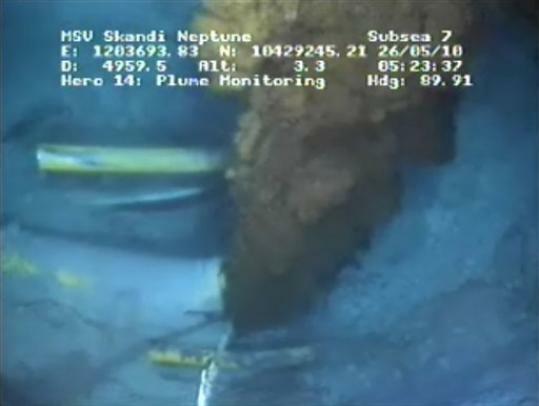 Moreover, new oil leaks located 6 miles away from the original site were discovered and raised the question whether earth changes beneath the ocean floor may be contributing to this unending mess. This lunation was soon followed by Saturn's station opposite the conjunction of expansive Jupiter and unpredictable Uranus both in the water sign of Pisces. 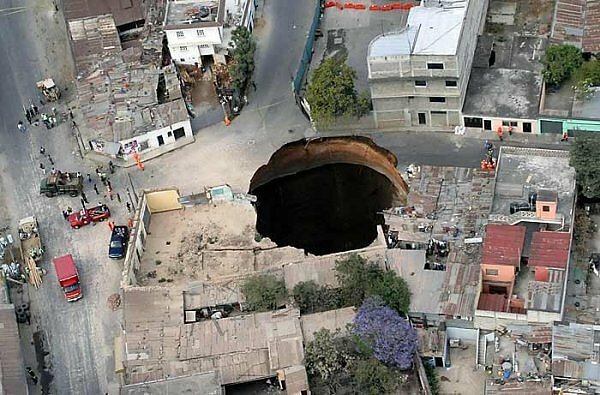 During this time the first massive hurricane of the season hit Guatemala and triggered a massive sink hole that sucked a three-story building from the face of the earth. Three days later China began reporting sinkholes as well. Saturn rules structure and foundation which seem to be dissolving under the Piscean influence of Jupiter. The expansive energy of Jupiter will be opposite the contracting energy of Saturn for most of the summer. I wouldn't be surprised if more earth shifts occur when Mars joins Saturn in Virgo in conjunction at the end of July. The month of June not only began with intense weather and earth anomalies, but also yielded some intriguing space activity. An amateur photographer caught an object hitting Jupiter on June 3, 2010 reminding us that this gas giant captures many space objects in its huge gravitational field that could in fact wipe out life on earth if they were to get past its protective pull. 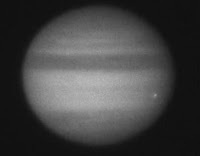 And don't forget that Jupiter made the news on May 17, 2010 when it was discovered that it lost one of its stripes. 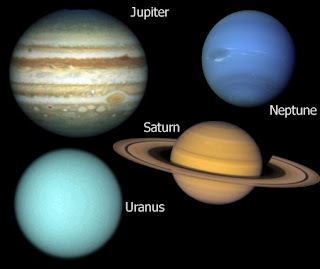 In Sanskrit Jupiter is called Guru meaning "the spiritual teacher" or "guide", so what happens to this planet astronomically may present a cosmic lesson for us to unravel astrologically. Jupiter has been traveling in its own sign of Pisces since the beginning of May and conjoined the planet of unpredictable and sudden changes, Uranus exactly on June 8, 2010. Jupiter conjunct Uranus is seen by Western astrologers as a transit of surprises and sudden opportunities. The consciousness expanding quality of Jupiter can bring new insight from a totally radical Uranian viewpoint. As Uranus is also in a mutual exchange with Neptune, the effects are like a Jupiter-Neptune conjunction as well. When the great teacher transits the planet of the sublime, we might expect to witness an increase of mystical and spiritual experiences, or a great teacher may appear, or a unexplainable phenomenon may occur such as the Australian spiral. 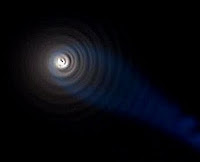 As with the December 9, 2009 Norway spiral, conventional scientists proposed an explanation of a missile of space junk for the June 5, 2010 UFO spiral. According to Australian media reports, the lollipop light that spiraled over Australia early Saturday and prompted a flood of UFO reports to local news stations was likely the remnants of SpaceX's Falcon 9 rocket that launched earlier that day. 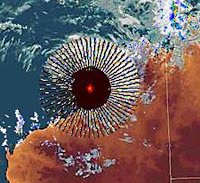 Still others researchers such as Colin Andrews suggest that HAARP or some similar human electromagnetic technology is another plausible explanation for the spiral that was large enough to be seen over three Australian states. In addition, Andrews has been following a series of anomalous weather effects over southeastern Australia which he attributes to HAARP emissions coming from a secret HAARP facility in Australia. Perhaps my favorite explanation is that the Australia spiral was a genuine interdimensional wormhole, or stargate, caused by a hyperdimensional or multi-dimensional intelligence. That same night I dreamed of UFOs over Seattle skies that only certain people could see. Some UFO researchers such as David Wilcock speculated that the Norway spiral was caused by a hyperdimensional intelligence, and the Australia spiral may also be "a man-made phenomenon that shows Disclosure [of the existence and presence of extraterrestrials on earth] is getting closer and closer all the time!" When you compare the event charts for the Norway and Australia spiral the main similarity is found in the chart ruler: Venus, both placed in the second house of family, value, speech, right eye, scriptural knowledge, and TRUTH. According to David Frawley, "Venus represents the higher astral and is the star of our astra light. She is the light of inspiration and our devotion to truth and beauty." The Norway Spiral had a Libra ascendant, and the Australia Spiral appeared under a Taurus ascendant with the Pleiades rising. As I discussed in a previous post, the Norway Venus was placed in the highly symbolic 17th nakshatra Anuradha, ruled by the Sun God Mitra, who is related to Mithra, Christ, the future Buddha, and the Maitreya. The Australia Venus was located in Gemini in the 7th nakshatra Punarvasu ruled by Aditi the Mother of the Sun Gods called the Adityas. The Adityas are a group of sun gods. Originally, there were seven or eight of them, but their number was expanded to twelve in the Vedic period. 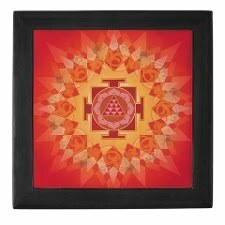 As the twelve sun gods they represent the twelve months of the year. The Adityas protect against various diseases, and belong to the Devas, a generic term for divine beings. They are: Ansa, Aryman, Bhaga, Daksha, Dhatri, Indra, Mitra, Ravi, Savitri, Surya, Varuna, and Yama. Moreover the words "Punar" means repeat, and "Vasu" translates as ray of light. Thus Punarvasu means the return of the light, or repeating light. Could this phenomenon be a signal that the Sun gods are returning? Punarvasu is also known as "the star of renewal" and marks the return of the light after the storm. The upcoming summer solstice occurs on June 21, 2010 and I would expect solar symbols such as the spiral, representing the path of the sun and structure of galaxies, to make headlines as the Sun marks its northern most declination. In Seattle, where we obsess about the fickle Sun, The Fremont Fair and Summer Solstice Parade herald the beginning of summer. This year's symbolically appropriate theme is Love the Earth. Astrologically the summer solstice Sun always occurs in the nakshatra Ardra. Ardra translates as "moist one" is depicted as a tear or rain drop. Like the tears of the Phoenix, another solar symbol, it is a healing nakshatra and is associated with the clarity that arises after a calamity, or the the clearing after a spring thunderstorm. Ardra is located in the sign of Gemini in the constellation of Orion and contains the fixed stars Betelgeuse and Sirius. 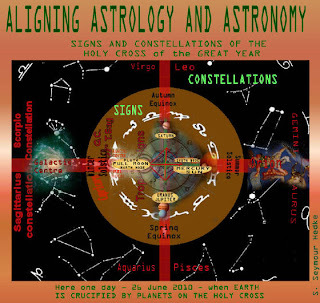 During the week of the summer solstice, there will also be an intense alignment involving all the outer planets squaring or opposing the Sun in Ardra in a Grand Mutable Cross. Essentially, a Grand Cross consists of four planets in the same mode or quality -- cardinal, fixed, or mutable, which form the four squares and two oppositions. A true Grand Cross includes a planetary placement in each element: Fire, Earth, Air or Water. Because the Grand Cross involves a combination of squares and oppositions, it is an aspect pattern that affects action and drive (squares) as well as perspective and balance with others (oppositions). The Outer Planets also known as the Transpersonal Planets and symbolize collective or subconscious awareness beyond our routine or regular concerns. They symbolize the need to integrate spiritual and group concerns into the demands of our ego ideas, affections and impulses. When they interact in a grand cross the collective issues are pushed into full consciousness and effect us globally. The mutable signs of Gemini, Virgo, Sagittarius and Pisces are adaptable, adjustable, changeable and flexible. Planets in these signs tend to be more interested in the journey than in the destination. They also tend to avoid conflict at all costs, because it is not in the nature of the mutable signs to engage in conflict, except as mediators or go-betweens. They will find a way around things. 6/26/2010 Full Moon 10 degrees Sagittarius, Mula nakshatra, a partial Lunar eclipse. The next full moon will occur under a partial lunar eclipse that also involves this grand mutable cross. The Moon will be under the shadow of Rahu and the potentially explosive influence of Pluto. Pluto is all about power and Rahu is about expansion of this power. Both the Moon and Pluto will be in exact conjunction at 10 Sagittarius, in the tikshna, or dreadful, nakshatra Mula. This asterism is located near the serpent holder of Ophiuchus and marks the galactic center. Mula is called the "root" star and marks the place where stellar life emerged in our galaxy. The deity of this nakshatra is Nirriti, the goddess of destruction who lives in the kingdom of the dead. As the goddess of destruction, Nirriti has the power to break things apart, barhana shakti. In Western astrology Pluto also rules over the kingdom of the dead. So what will happen when these two meet under the moon light of an eclipse? There will certainly be some rumbling. 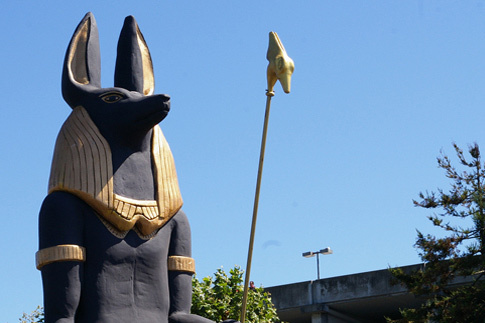 Thus the newest bizarre installation of a 7 ton replica of Anubis, the Egyptian guardian of the afterlife, at the Denver Airport is symbolically very intriguing. According to airport officials this 26 foot stature is part of a promotion for the King Tut exhibit which that opens at the Denver Art Museum on June 26, 2010 -- the very day of the lunar eclipse. Many are already questioning why on earth a huge monument to the underworld would be erected at a place like an airport, especially with Anubis being the one responsible for helping out the newly dead on their final journey; but this is no ordinary airport. It is an airport filled with apocalyptic art projects as well as legends of intrigue such as extra-long runways for future space brothers, underground tunnels, and unexplained deaths. Perhaps Anubis is appropriate after all for this lunar eclipse. Astrological traditions view eclipse cycles as a karmic time periods in which the obscuration of the luminaries brings out psychological disturbances, political unrest, shadow issues, and fear. As this is a Rahu eclipse of the Moon in a Ketu nakshatra, we may expect to see even more karmic patterns surface as the nodes are intertwined in their own symbolic spirals. The nakshatra Mula is ruled by Ketu, the indicator of moksha, or spiritual liberation. Ketu aspects this lunar eclipse from its position in Rahu's tearful nakshatra, Ardra. As tears of a sorrow release emotional build up, they cleanse the eyes and give clarity of perception. So while this intense eclipse period may release forces that inflict pain and suffering, it is important to remember it is a result of us being out of alignment with the divine. Mula presents opportunities to return to god-realization, but we must surrender to receive this intense galactic light, let go of what is not working, and allow new life to emerge. UPDATE: Spirals are in the headlines. See Starsyncs. UPDATE: Hurricane Category 4, Celia. Thank you again for such a great read! About the spiral over Australia. You obviously don't live in Austrralia, so you wouldn't know this. At the time of when the spiral appeared over Western Australia there was a cyclone in the exact same spot as where the spiral was. From December to sometime in March of each year is our cyclone season. The spiral, which everyone saw on the weather chart, as you have added in this post, is nothing more than a cyclone. Obviously there was something wrong with the satellite's equipment for this image to appear like that. I remember the cyclone being there over Western Australia but have since forgotten its name. Just thought you might like to know this because humans tend to jump to conclusions a lot.